AllThingsD reports on a new research note from Jeffries analyst Peter Misek suggesting that manufacturers are already "scrambling" to react to claims that Apple is preparing to enter the television set market. And rather than innovating on their own, competitors are reportedly focused on trying to identify what Apple will do to revolutionize the industry. Misek notes that Sharp appears to be retooling an LCD production line to suit Apple's needs, with mass production on the line reportedly targeted for February 2012. Such a development could put a product release sometime in the middle of the year. 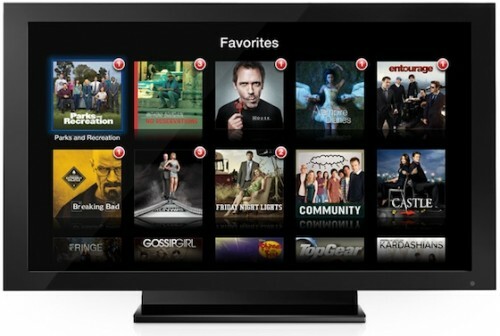 Previous rumors had claimed that Apple could announce its television set by late 2012 and launch the product by early 2013. Whatever Apple's plans are, Misek suggests that competitors will almost certainly be six to twelve months behind with their own offerings, giving Apple a significant advantage in the marketplace if it truly does offer a revolutionary new product. Sony has been the most visible company seeking to head off Apple's potential blockbuster entrance into the market, working to develop a "four screen" strategy across TVs, computers, tablets, and phones and investigating Web-based television services that would enable consumers to bypass traditional cable companies. Apple has dabbled in television with its Apple TV set-top box and TV content available through the iTunes Store, but the company's ultimate plans are said to be much more ambitious, involving actual television sets incorporating Siri functionality that premiered in the iPhone 4S. The company has also reportedly developed a "new technology" for delivering content to TV sets and has expressed interest in offering "best of TV" bundles of shows, although content providers have yet to agree to such a plan. Apple has the most affordable ultrabook, a phone that is occasionally cheaper than some of their competitors, and the tablet that brought the industry to its knees trying to match the price. The idea of an "apple tax" is quickly becoming a myth. Let's all bookmark this article for the next time someone says "Apple should stop being so secret and just tell us all their future plans. It'll raise sales since we'll all be excited longer!" If it weren't for Apple, we'd likely still have phones on the market with physical buttons and 2" screens. I don't want to have to talk to my TV. Better than the wife, at least you can mute your TV! Wow, and you thought the cell phone law suites were numerous. Wait until this cesspool cover gets removed !!!!!!!! iTunes Ecosystem wasn't built in a day. It took years for Apple to sell iPods, iPhones, iPads and other devices to create a stage for iTunes. The logic applies the other way too. iTunes helped apple to create a stage to sell iDevices other apple products. I have been using iTunes to buy music for the past 2 weeks and its unbelievably awesome. I am a collector person; I like buying vinyls, CDs, DVDs but I guess even I have to change with the world changing so fast. AppleTV is there and is coming sooner than we all thought and its going to change the way people see and listen to music, videos, movies, TV shows etc. Other companies cannot just dream about all of this in a single day. Apple has everything in its playground. They just need to show it to us. These other companies don't even have a playground; they're just dreaming about it. We will see where Apple stands. fantastic! that's the way it should be. But too bad it takes hearing Apple is doing something new in their market to push innovation. I want to be an analyst and be paid for saying anything I want, even the most silly thing. Is it me or does this seem to be a made up story? Is it me, or does this site seem to mainly report and discuss rumors? By the time Apple's lawyers have finished with them they'll be lucky to still have the T and the V. There was a well established Apple doing rather well in the music business since the sixties, but that didn't worry anyone in Cupertino. It will not be called iTV. Not unless Apple fancy trying to get the second largest, 55 year old TV network in the UK to rebrand. Not no way, not no how. Its the kind of thing the Government would step in and block anyway. Remember, US law doesn't come into it, its UK law and UK law will favor ITV.